It's safe to say that I'm highly addicted to the electric hues from the hot new neon trend - and the folks over at modcloth aren't helping my fixation with these vibrant temptations. From color blocked dresses to colorful clutches and cameras - these lust-worthy extras are exactly the punch my wardrobe needs. 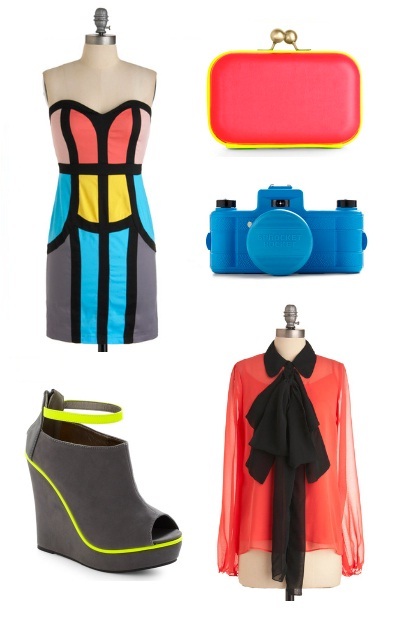 Are you fan of the neon trend? I am a big fan on Neon! I wore a neon top Saturday. That dress you have on here would change my life! I'll take that clutch pretty please! I love the neon trend as well in touches. That dress is quite cool though. I love these, that top is awesome! I'm actually a big fan. It's just so fun and reminds me of the 80s. That clutch is amazing. WANT!